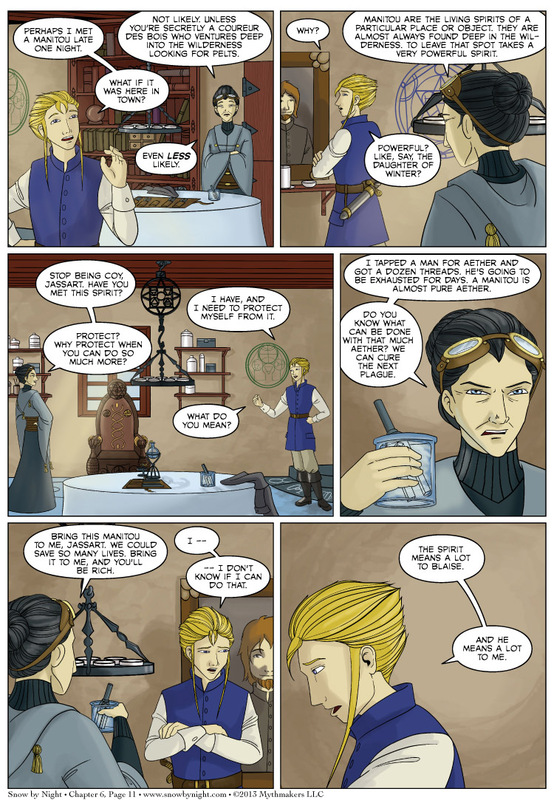 Bertrande offers Jassart a solution to all of his problems in Chapter 6 Page 11. A solution so horrible that even he shies away from it. And for our vote incentive on Top Web Comic — clothing! Our Art Contest continues. Eight contestants; four match ups. Vote today (and everyday) to help pick the winners. Also, Diane and I will be at Zenkaikon this weekend. Come by and see us if you’re attending. We went live with our site redesign over this past weekend. While most of the changes were welcomed, several readers brought up their love of the landing page. This page gave a preview of the latest page and contained link icons to Page 1 and the Table of Contents. I liked both of the link icons, so the icons will be returning as soon as the art is finished for them. So what is your preference? Should we post the latest page of the comic on the index page of the site? Or should we post a preview that takes you to the latest page of the comic? Let us know. We want this to be an enjoyable reading experience. Definitely the preview! It only takes one extra click to get to the latest but prevents spoilers for anyone not up to date on the story. Yes, you will need to update any old bookmarks to direct to http://www.snowbynight.com with the new redesign. Old links to .html pages are not going to work because the site is no longer coded in HTML. Oh dear, I knew she was shady and Jassart’s will is not the strongest, especially when it comes to possible profit! Well, maybe donating a bit of her substance for the good of others is the kind of action that might help her develop a heart. Bad, very bad. Jassart is not careful enough and he could destruction the Manitou without any recourse. Now that I have bookmark the new site I will go and delete the old one. Had me worried for a bit there. Showing concern for someone else, even when offered riches beyond the dreams of avarice? Wonder what he did with the real Jassart Leblanc? That assumes Jassart isn’t just trying to get a bigger payout. I prefer the main page as it is now, with the latest comic page, commentary, and comments already visible without having to be loaded separately. As for extracting aether from Snow by Night, I find it interesting that Jassart’s first objection isn’t that she might be quite unwilling, and powerful enough to prevent it from happening. Not to mention how unwise it would be to make an enemy out of her father. But it’s a good point that she could perhaps donate aether willingly for a good cause. But in such a case I don’t see why Blaise would object. Jassart can be such a jerk, but at least he doesn’t want to hurt his friend! Though, if he’d listened to Blaise more throughout, he wouldn’t need protection . . . I read the entire archive (including the almanac) for this comic a couple weeks back and I love it! The world is so well thought out . . . Thank you! That would be my D&D training kicking in. I can’t help but world build. Also, it lets me play around with accepted fantasy norms. Instead of Blaise and Mathilde sitting in a tavern, we can make it a chocolate house and they’re sipping steaming cups of hot cocoa instead of kicking back ice-cold ale. So far, I don’t understand. Jassart and Blaise are interesting, but Snow-By-Night… not so much. I don’t get why Blaise is so obsessed with her. And Bertrande makes sense. Cure the next plague? More worthwhile than helping a lunatic spirit find her metaphorical heart. That would be Bertrande’s late husband. He is the main character in the vignette for Chapter 7 so I’m laying a bit of ground work here. He’s mentioned in Bertrande’s character entry, but I didn’t like how the story worked out with him running afoul of the natives so that entry will be edited in the near future. Probably tonight.